In Q4 2018, premium publishers expanded their lead over aggregators in the percentage of overall impressions served by media type, finishing Q4 with 74% vs 26% for aggregators. 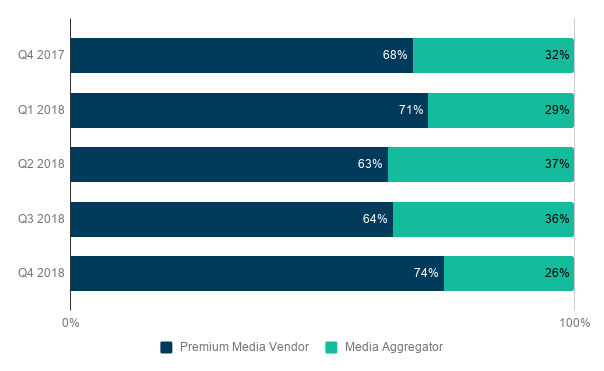 That’s a substantial shift from Q3 when premium publishers accounted for 64% vs 36% for aggregators. 30-second ads made a strong comeback between Q4 2017 and Q4 2018. The share of impressions commanded by 30-second spots in that one-year period more than doubled from 28.5% to 58%. 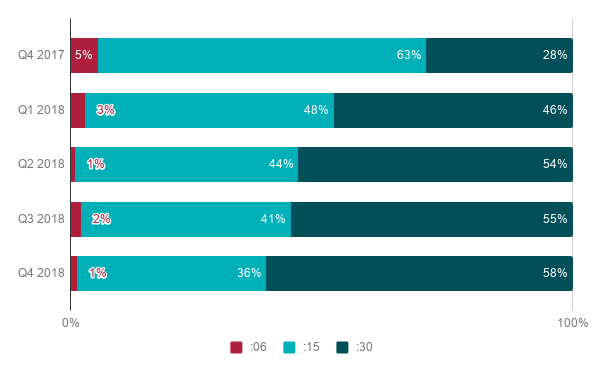 At the same time, the share of 6-second and 15-second video ads declined dramatically, from 5% to 1% for 6-second spots and from 63% to 36% for 15-second ads. The resurgence of longer creative aligns with the growth of CTV, a format conducive to a lean-back, TV-like mode of viewing. Note: small data sample sources for other ad lengths have been excluded, hence the rows in this chart do not total 100. 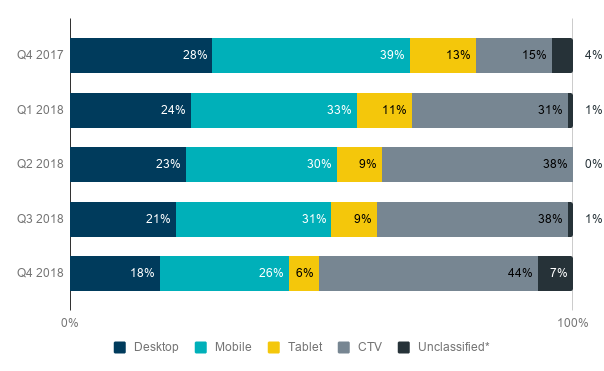 For the last five quarters we’ve seen a continuing trend: the decline of overall impressions served to desktop, mobile and tablet, while CTV has surged ahead. The jump from 15% of impressions in Q4 2017 to 44% in Q4 2018 amounts to a growth of 193% in CTV impressions in just one year. For advertisers, directly-bought CTV provides a brand safe environment that remains relatively insulated from the high frequency/outlier and bot activity found in other digital channels. Advertisers should be aware, though, that where there are such dramatic increases in impressions served, hence money spent, non-human activity is bound to follow. Continuous data gathering and analysis from Extreme Reach will provide early warning signals for increased fraud attempts and the ability to contain it. *Unclassified captures impressions from user agents who are known to be valid, as per industry sources, but whose platform or device we are unable to identify.